There are a variety of scoring systems in NCAA pools. The most common is to double the points for each round: 1-2-4-8-16-32. This puts a lot of emphasis on the championship, making the early rounds largely irrelevant. The other extreme is to make all points the same: 1-1-1-1-1-1. This has the opposite effect of making the championship largely irrelevant. I wanted to find a mathematically ideal balance. I discovered that Fibonacci scoring or something similar was the best fit. 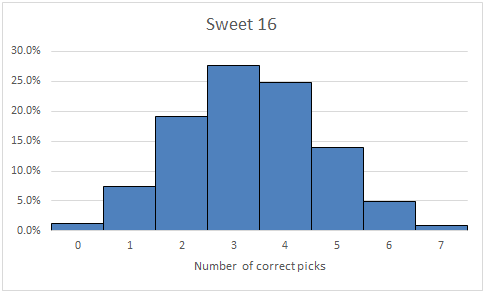 To start with, I pulled National Bracket data from ESPN to get a measure of the variation in how people pick their brackets. 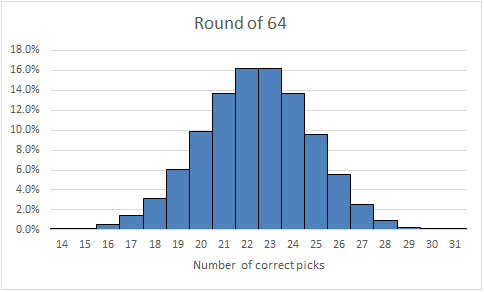 I compared it to the actual tournament results dating back to 1985 when the field was expanded to 64 teams. 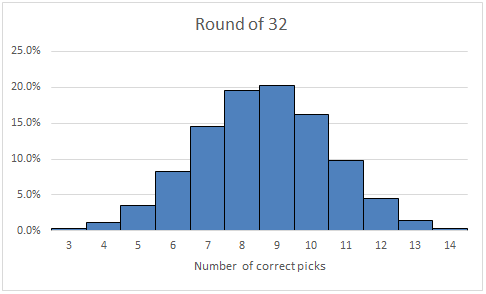 Most people get 22 or 23 picks right in the first round, with a standard deviation of 2.4.